Please note can only post to UK address on this product due to the chemical fluid within the cartridges being highly flammable. 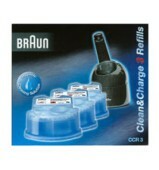 The Braun Clean and Renew cartridges really do clean my razor very efficiently and leave it with a nice lemony smell. Couldnt do without them. Fast and efficient service at a very good price. A quality product - just the best.